Nathan McDonald and Leila Thabet of We Are Social recently published an article in the online trend and culture magazine, Contagious. 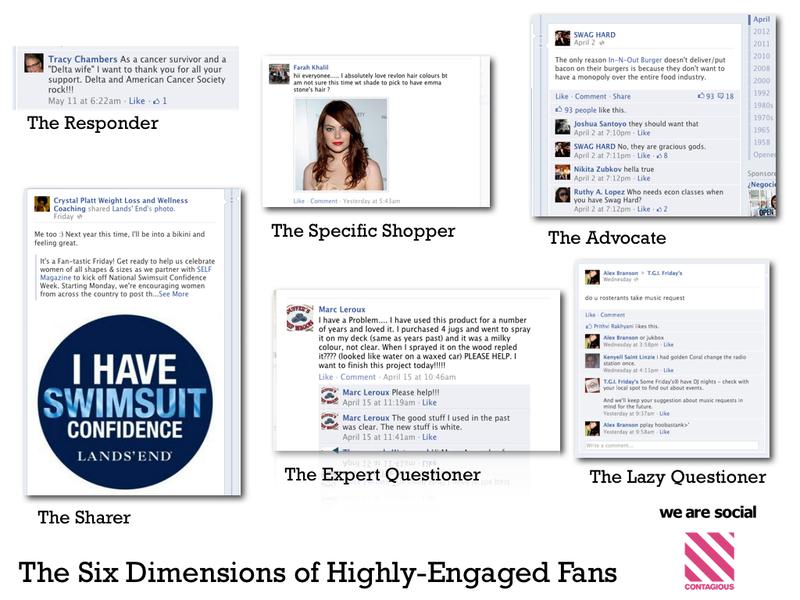 They present a deeper look at the different types of engaged fans/users/followers (whatever you want to call them) in social media. They point out that in most cases there is going to be a small majority that comment, post, share and engage the most. They provide a breakdown of the different types of fans they have identified among this group. To increase engagement, make sure you incorporate opportunities for each of these fans to participate. The Responder – Count on these fans to answer a question, enter a competition, like your posts and generally follow your direction. They may need prompting but they will be there for you on a rainy day and will keep your overall levels of engagement up. Create regular opportunities for these fans to participate with straightforward instructions and thank them when they do so. The Sharer – Extending the reach of your conversations, these fans love to redistribute social content to their networks. Think of Sharers as part of your social distribution network. It’s important to make it easy for them to do what they do best: retweet, reblog, repost or sometimes remix. They may have a sizable or influential network of their own, so make an effort to understand the secondary audience, and consider providing them with exclusive content. If appropriate, look for ways to reward Sharers by involving them in the creation or curation process. Monitor what they share and how they share it to learn what works best. Beware that negative content can be shared just as easily. The Expert Questioner – These fans like to demonstrate how much they already know by asking questions. They might be asking obscure technical questions, or how a specific component compares to the special edition model from two years ago. What they really want is a chance to show off their encyclopedic knowledge of your product line. Encourage these fans to help answer other questions from the less informed. Or go further and reward them by inviting them to visit your HQ. Their deep expertise could help craft subtle improvements in your products. The Lazy Questioner – In some ways the opposite of the Expert Questioner, these fans ask the most basic (and sometimes irrelevant) questions, whilst making no effort to discover the answer. The Lazy Questioner hasn’t bothered to Google a keyword or two, let alone visit your website, read previous blog posts or comments. They love your product or brand but they also love it when you serve the answers up to them. Demonstrate great customer service and create links to your product info that will be visible to others by answering them promptly. It’s also an opportunity to defer to the knowledge of your Experts, who will relish the status you have bestowed on them. The Specific Shopper – Another type of Questioner, these fans want to get involved in a conversation about specifics. Does it come in another shade of blue? Can it be gift-wrapped and shipped to Brazil? What accessories are compatible? These actively engaged people want to know the detail, either to get a product or service that’s just right for them, or because they are investing a lot of emotional energy in your brand. They may have deep knowledge of your category, or be a novice, so try to find out their level of expertise if you can. Then show the community how much you care about your fans by giving them the detail they need. They may buy one for themselves as well as their friend in Brazil. The Advocate – Over time and with the right treatment, the fans above may evolve into the most important members of your community. Advocates may talk about you unprompted, upload photos of themselves with your products, or privately give you feedback about that time you could have done better. They may be so engaged in the conversation they invite their friends to join in, and will share your excitement when you launch something new, have new news or big wins. They may also appear out of nowhere to defend you against criticism – especially valuable in times of crisis. The ultimate advocates generate positive conversation by encouraging others to try your products or services. Constant Critics – Finally, remember that some of the most engaged people may be your critics, which is not necessarily a bad thing. These ‘Constant Critics’ may well be using your products and services already, and can offer valuable insight into where the pain points for certain types of customer are located. By listening carefully and treating them with respect, you may turn your critics into Advocates. Which is cause to celebrate. I think I have encountered each of them at one time or another. And really so true that you need different strategies to deal with them and encourage them to speak out and join online conversations. Thanks for categorizing them, it gives us more sense of clarity.